We’ve all been hearing and talking about the surge of men getting fired, losing control of their companies, and otherwise being disciplined for sexual harassment and other bad behavior — and we’ve all been heartened by the groundswell of support for the women and men brave enough to come forward. I’m hopeful that we are at the beginning of a tectonic shift in the way sexual harassment is handled at companies, where the default becomes “I believe her” — it’s about time. (Full disclosure, considering the stock photo: this is not a #metoo story, but my heart goes out to the many, many, many women and men who have such stories.) 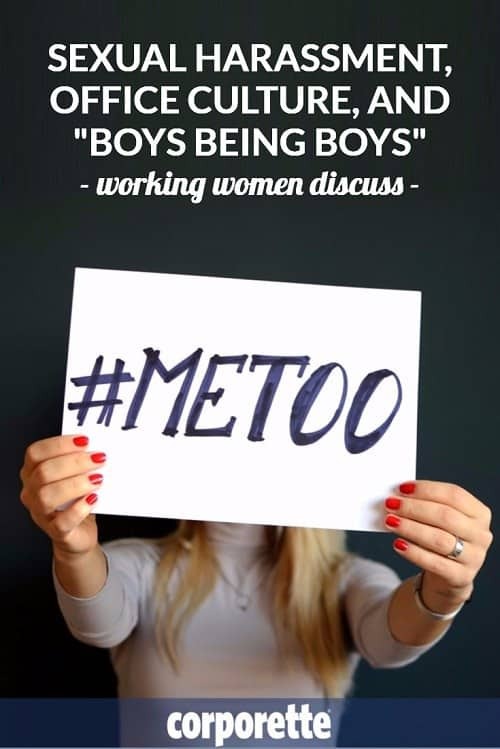 There’s been a lot of discussion and think pieces on this topic in the press — but here are a few questions I haven’t seen discussed that might be interesting topics here: 1) How do you think these past few weeks will affect the companies, colleagues, and protégés (both male and female) of these men? How will they ever distance themselves enough? 2) For those of you who work at men-dominated firms where, perhaps, a “boys will be boys” attitude has prevailed in the past, has anything changed in the past few weeks? What are the positive changes you’ve seen (whether from HR, company/firm-wide meetings, etc.) that make you optimistic about the future? With regards to the first question about resumes and protégés: Let’s say you run a production company in Hollywood. A man comes in to interview for an opening and his resume notes that he worked closely with Harvey Weinstein — which, before a couple of months ago, would have been a huge resume boon (granted, there’d been rumors about his behavior). Do you consider his resume? If he makes it to the interview stage, do you ask about it — whether he “knew” what was going on and was ok with it, whether it was part of company culture that he accepted and perhaps expects at your company? If it’s a woman instead of a man — with the same resume — how does that change things? Psst: In the past, we’ve discussed a lot of sexism issues, including sexual harassment at work, how to deal when you work with sexist pigs, what to do when your client hits on you, and how to make your boss stop flirting with you. Stock photo at top via Pixabay. The post Sexual Harassment, Office Culture, Resumes, and “Boys Being Boys” appeared first on Corporette.com.